To its credit, General Motors has managed to make its premium Buick division relevant over the years, turning it into a fully-fledged competitor to the likes of Acura. For years, Buicks were little more than rebadged Chevys with fancier trim lines and bogus design bits designed to fool the eye. Consumers eventually caught on. Buick survived GM’s bankruptcy solely because of one country: China. Buicks are huge there and thanks to fresh styling and an overall new attitude, Buick has lived to see another day. Well, at least most Buicks. As points out, sales for the Cascada convertible in the final quarter of last year were pretty terrible. A grand total of 743 units were sold in the final months of 2018, a decline of 31 percent compared to the same time last year. It’s worth noting that the , not even Canada or Mexico, and it competes directly against the likes of the Mazda MX-5 Miata, Fiat 124 Spider, and the Audi A3 convertible. Compared to the MX-5 and 124, Cascada sales experienced the most significant drop in Q4 2018. The Mazda dropped by just over 4 percent the Fiat by a more troubling 26 percent. The Audi’s sales figures are not available because the automaker clumps A3 sedan, Sportback e-tron, and convertible as one figure. It’s also important to note that the final months of any year are typically not the best to buy convertible because, well, it’s winter time. 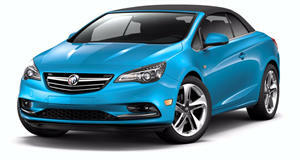 But still, compared to its direct competitors, the Cascada is clearly not doing well. Unveiled in 2015, the Buick Cascada is little more than a rebadged Opel Cascada, a vehicle that initially went on sale in Europe back in 2012. Needless to say, the design is aging fast. Furthermore, , having been sold to the PSA Group a while back, so a direct Cascada successor is looking unlikely. Adding to that, the overall dedicated convertible segment was down 22 percent last year compared to 2017. Given the Cascada’s age and diminishing demand, chances are 2019 will be its final year. While showing its age, the Buick Cascada is competitive enough to be worth considering.